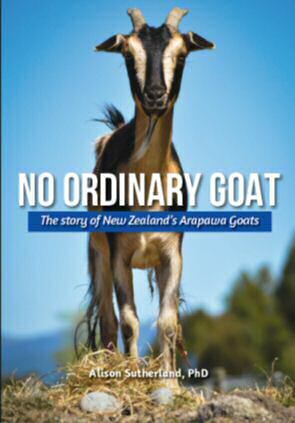 Alison Sutherland (organizer of the New Zealand Arapawa Goats Association) has published a book on our Arapawa Goats. For years there has been some controversy as to when their ancestors first came to New Zealand and this book is the result of four years of comprehensive research into their origin and history. Printed in New Zealand, No Ordinary Goat, The Story of New Zealand’s Arapawa Goats, is a large (255 x 175 millimetres), soft cover book of 224 pages, with over 50 illustrations in colour. Copies may be ordered on line from – www.yourbooks.co.nz/no-ordinary-goat-alison-sutherland.